Check out the new W.I.T.S. Health and Fitness Academy! The gym is a great place to work, and there are a variety of jobs available at your local fitness club to help get your foot in the door. Some jobs require education and experience, while others are entry level positions that anyone with good people skills can do. Here are just a few of the most popular. 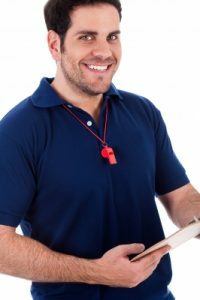 Personal Trainer: Perhaps one of the most enviable jobs in the gym, the personal training staff knows how to help members get results, and that makes them superstars. Pay varies, but a good trainer with a solid lineup can expect to make between $25-$30 an hour in a big box gym. Education: Certification, plus possibly Bachelor’s degree. Group Exercise Instructor: Not a bad part-time gig, top performing GX instructors have a following, and make about the same as personal trainers. However, due to the physical demands of teaching and the way classes are run, you will rarely get more than 10 hours per week. The up side is that each class is a great workout for the instructor, so you will be in super shape! Education: Certification. Membership Sales: This position is usually salaried, with bonuses, commissions and benefits. For that reason, it is one of the more stable positions in the gym, and you can expect to make $40,000 to $70,000 a year. Education: Bachelor’s, or equivalent experience. Fitness Director: Depending on the facility, the fitness director often oversees personal training and group exercise. This is normally a salaried position that requires a lot of attention to detail, and includes all the headaches of scheduling and managing staff. Pay is around $40,000 to $50,000, plus bonuses and benefits. Education: Certification, plus possibly Bachelor’s degree. Membership Director: The membership director is responsible for new and existing members, including membership retention. This is a managerial position that oversees sales staff and makes sure that the bottom line continues to grow. This job requires a knack for numbers and a willingness to be accountable for the gym’s bottom line. Expect to make $50,000 to $70,000+ a year, plus benefits. Education: Bachelor’s or equivalent experience. Front Desk Staff: If you hate sitting all day and like to keep busy, this is the job for you. Job duties include greeting members, answering member queries, working with membership staff, answering the phone, folding towels, working with management, and a myriad of odd jobs that need to be done to keep the gym humming along. You will be so busy that your shift will fly by! The pay ranges from $10 to $15 an hour, not great, but it beats flipping burgers. Education: High school grad. One of the great things about working in the fitness industry is that it offers countless opportunities to learn and grow. Many front desk attendants have moved on to become managers, GX instructors and personal trainers. Most big box gyms also have corporate and administrative positions. They sky is the limit! When it comes to the business of personal training, W.I.T.S. has always been ahead of the pack, providing continuing education geared to helping your business succeed. Our Online Business Success Series of courses offers everything you need to know about business success, including marketing, sales, and much much more! Learn and earn, as you add valuable CECs toward your Personal Trainer Certification renewal.